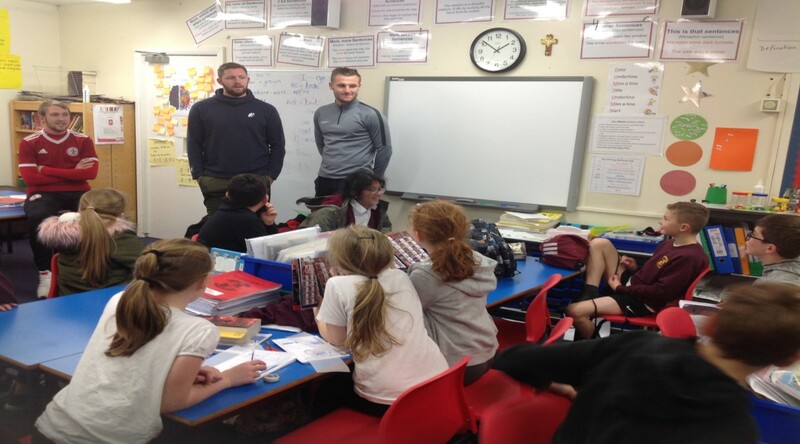 Accrington Stanley Defender Nick Anderton and Goalkeeper Jonny Maxted went back to school this week to surprise the year five pupils at Benjamin Hargreaves. The Kinder+Sport ‘Move and Learn Project’ is targeted at primary school children aged between nine and ten years old, the programme combines six weeks of practical sporting sessions with classroom based activities. During each 90 minute session children learn about the body, diet, nutrition, food groups and the importance of exercise as well as taking part in a session of football, handball and dodgeball. For more information on the Kinder+Sport ‘Move and Learn’ sessions please contact the ASCT’s Josh Cooper on 01254 304071 or email Josh.cooper@stanleytrust.co.uk.